The U.S. Consumer Product Safety Commission is urging all consumers who have Samsung Galaxy Note7 smartphones to "power them down and stop charging or using the device." The warning from the CPSC comes amid growing concern after lithium-ion batters in certain Note7 devices have caught fire while charging. Just Thursday, the FAA issued a warning that advised passengers to keep their Note7 turned off while on an airplane. The FAA advises that passengers "not to turn on or charge these devices on board aircraft and not to stow them in any check baggage." The three biggest U.S. airlines - American, Delta and United - said Friday that they were studying the FAA warning but it was unclear how they would make sure that passengers keep the Samsung devices powered off. A Delta Air Lines spokesman, Morgan Durrant, said "For now, we are studying this." American Airlines spokesman Ross Feinstein said the company is speaking with the FAA, but had not made any changes in policy for passengers and what technology they can bring on board. Spokesman Luke Punzenberger said United was reviewing the FAA's guidance and would "raise awareness with our employees and passengers about these devices." He said flight attendants would change their safety announcements as soon as Friday to include a mention of the Samsung phone. CPSC says it is working with Samsung to formally announce a recall of the devices. 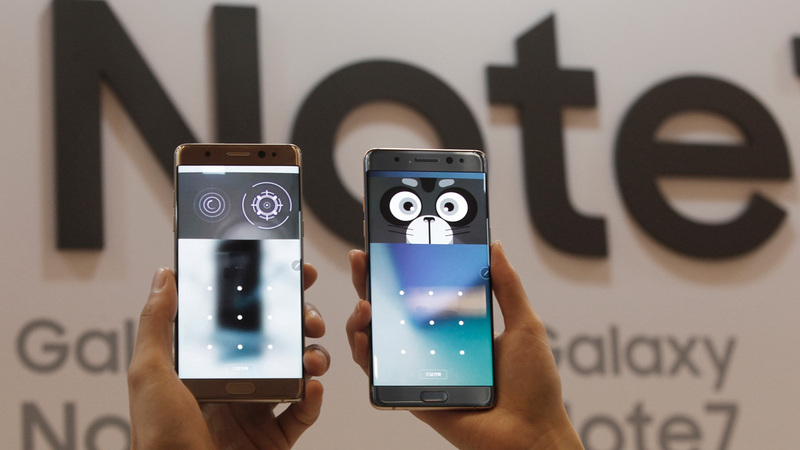 Samsung suspended the sales of the Note7 last week.